You must be wondering why am I parroting these stale news headlines, in the boring, lackadaisical manner of print reporters. After all, these incidents are etched on our memory, mainly due to over-the-top media frenzy, bombarding us constantly with blood boiling debates and discussions over the apathy of our judicial system. In the not-so-distant past, the channels were flooded with the somber TV journalists crying hoarse on injustice meted out to the poor and innocent, trying to bring a revolution. And, then, one fine day, media got bored of the story and simply chucked it for a more sensational, gorier crime. Well, this is the naked truth of our society. But, what if, someone picks up the abandoned story and decides to give the cruel murderer a taste of his own medicine? Would this role reversal change the reality and make world a better place or would it create even more chaos? 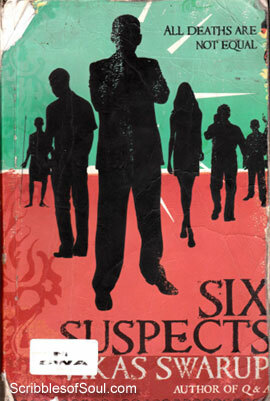 All this and much more is explored in the fantastic ‘Six Suspects’ by Vikas Swarup. Vikas awed the world with his poignant ‘Q & A’ and proves his mettle once again with the off-beat ‘Six Suspects’. Here, he decides to take the story a notch higher, imagines the poetic justice to be hurled on the rich brat, with him being killed in the same gory, cold blooded fashion, as his victims. He presents the reality hidden behind the pretended media trial and the truth of seedy sting operations. In a virtual investigation, he lays bare the inefficiency of our legal system, and the insensitivity and immaturity of the so-called harbingers of justice. ‘Six Suspects’ tells the story of Vivek ‘Vicky’ Rai, the spoilt son of UP Home Minister Jagannath Rai. Vicky is a notorious businessman, a cruel murderer and a lusty producer. He does not bat an eyelid while killing sleeping pedestrians, rare Bucks and innocent model. Moreover, the shoddy legal system and his high profile father ensures that he is acquitted of all the charges and continues to live a dashing life. But, there is an investigative journalist, Arun Advani, who is hell bent on blowing the lid and bring Vicky to justice. But, even before, he could gather enough evidences, in a bizarre turn of events, Vicky himself is shot dead at his farmhouse, in his very own party! The police rounds up six suspects, who are found in possession of a gun at the crime scene. Arun Advani takes it upon himself to trace the killer of Vicky, to ensure that justice is given to the most unjust person of this world. And, thus begins this fantastic novel. ‘Six Suspects’ – a bizarre combination of sensational real life crimes, sprinkled liberally with a lethal dose of politics, money and glamor. In a very simple manner, Swarup gives us an insight into the background of these six suspects and their possible motives for murdering Vicky. The suspects are a motley of character ranging from Munnabhai inspired Ex-bureaucrat to a glamorous, popular actress, to a love blind naive American. An innocent tribal from Andaman, a petty mobile thief and Vicky’s high profile father also join the strange brigade, and there begins the roller coaster ride of this once-in-a-life-time, never heard before murder mystery. I am hesitant to divulge any more of the story, as it would spoil your fun. But, I would definitely urge you not to consider this novel, as just another murder mystery. It would be an utter waste of your grey cells, if you read this novel, just to solve the murder of Vicky. Believe me, its not the top agenda. In fact, just after a few pages, I doubt whether, you would actually be thinking about the murderer. Swaroop’s lucid narrative ensures that the readers are lost in the myriad, hazy worlds of six suspects, rather than thinking about the culprit. The novel is written in a simple fashion, tracing the backgrounds of suspects, their life stories, their motives and finally the verdict. But, leave aside the technical part, I simply enjoyed the novel for its unique characterization. It is a study of human emotions and feelings, often sidelined for name and fame. Swarup’s gripping narrative ensured that I could enjoy each suspect’s introduction as a separate novel. I was much more interested in the failed romantic overtures of Munna Mobile, the impertinent search of Shivlinga by Eketi and the utter naivety of Larry Page, who is swindled by a fake Indian woman, with the promise of a big fat Indian wedding. Add to this, the unique narration techniques used by the author. He tells the story of haughty bureaucrat in a distant, passive voice, but lends a very personal touch to the stories of Larry Page and Munna Mobile, who talk in their passionate, accented language. The story of the politician, Jagannath is solely in the form of telephone conversations, while Shabnam Saxena, the ambitious actress is unfolded by the excerpts of her personal diary. These techniques ensured that the reader is able to form an instant connection with the protagonists, though the actual reason for using different narratives is understood only at the end. As the story unfolds, many times, I felt as if all these events are pretty ordinary. I have already heard, read or seen them somewhere. After all, who is not aware of the secret ambition of a poor slum dweller to get rich, of the desperate attempts by a top actress to maintain her popularity and dignity, or, for that matter, of the harsh life meted out to the victims of Bhopal Gas Tragedy. But, this novel is a celebration of ordinary, the often heard about stories mingle to form an extra ordinary novel. A must read novel, despite its slightly off beat climax and a lengthy sermonic approach at the end. The book contains all the essential ingredients of a super duper hit movie. In fact, at times, I felt as if I was watching a Bollywood flick, instead of just reading a novel. Nevertheless, it is the first book, that I would love to see on the big screen, if and when a thinking director dons his hat and calls the shots. In the meantime, just enjoy the book! actually waited desperately for the release of this book and even though I had expectations , the book was fabulous. It was gripping from the first page and the stories of the various charecters were believble and real. I loved it and I think it’s a must read.